The thymus is an organ that is secretory in pre-pubescence, which earns its status as a gland. The thymus gland has an important role in immune function. One of its main secretions is the hormone thymosin. Thymosin stimulates the maturation of T cells, which are derivatives of the white blood cells that circulate our system. T cells “kill” or are cytotoxic to damaged cells. The damaged cells may be cancerous cells that have lost the ability to stop proliferating, or even cells infected with viruses. T cells will be able to bind the T receptor on the target cell’s surface that will initiate its eventual death. The T cell’s cytotoxicity comes from the cytokines it produces. Despite the thymus’ essential role in immune health, the thymus gland is not active during our entire lifetime. In fact, it is only active until puberty and becomes non-functional in adulthood. But its actions are instrumental in preventing the body from having an autoimmune response, which is when the immune system cannot distinguish between itself and foreign agents. Chronic periods of fever, fatigue, and malaise mark the lives of patients with autoimmune diseases. Therefore, the thymus gland is closely tied to the lymphatic system as it is the body’s natural defense network. The network of vessels and tissues that make up the lymphatic system make it possible for the body to expel or “drain” toxins and waste from the body. The thymus is a soft organ located behind the breastbone and between the lungs. 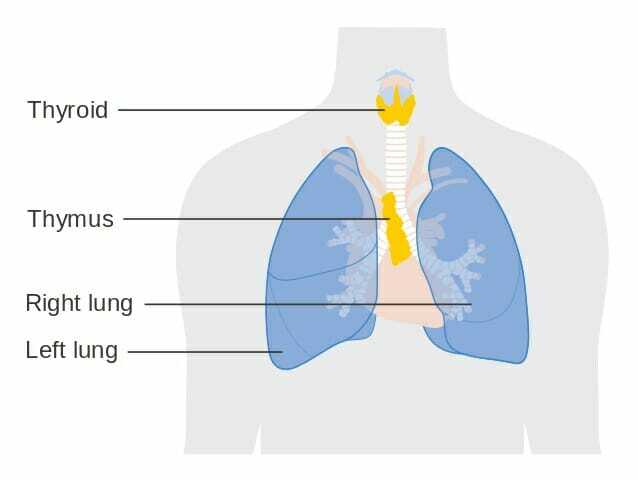 In relation to the organs in the human body, the thymus is a two-lobed structure that lies almost on top of the heart and traces up along the trachea. The thymus gland is more or less triangular in shape and has two lobes that are encased in a fibrous exterior. Its thymic lobes are an opaque pink, and the most superficial layer is named the cortex. When the thymus is sliced for a histology study, it will reveal a deeper layer called the medulla. If the human chest were divided into four regions, the thymus would be located right in the center of the upper quadrants with both clavicles beside it. The image depicts an anatomical illustration of the thymus gland, in relation to other important organs. The thymus gland is made up of a patchwork of epithelial tissue and lymphatic tissue. Likewise, the tissues will contain dendritic, or “antigen presenting,” cells that will signal off the killer T cells. Meanwhile macrophages will be present as well to eat away any cellular debris or to directly ingest foreign pathogens. The macrophage and dendritic cells really populate the thymus, which of course is crucial as they assist the thymus gland in performing its immune functions of discarding harmful waste and identifying diseased cells to destroy. The thymus gland is active in childhood and reaches it maximum weight of around one ounce during puberty. However, after reaching this pinnacle, the thymus will become less and less active. This decline in activity will correspond to a decrease in size as well, until the thymus tissue is almost completely replaced by fat. This shrinking will take place after puberty and into adulthood. As previously alluded to, the main function of the thymus gland is to release thymosin hormone that will stimulate the maturation of T cells. All of our childhood, white blood cells or lymphocytes will come in contact with the thymus gland. This contact will transform them into T cells. Once the T cells have matured, they will migrate to the lymph nodes which are the stores of immune cells in the body. So, the thymus gland can be understood to be a recipient of immature T cells that were created in the bone marrow but have yet to reach full maturation. Once the thymus receives the cells, they will be trained to only attack foreign agents. The way this happens is through positive selection. Only the T cells that have properly responded to foreign antigens will be selected to survive and eventually migrate to the medulla. The T cells that do not make the cut will die by apoptosis in a healthy patient. Once the surviving T cells have reached the medulla, the T cells will proceed to mature. The remaining T cells will go on to kill pathogens, will activate helper B cells that make antibodies against specific antigens, and will store the memories of previous infections and viruses so that the body can be better prepared to fight them off if they ever return. 1. Which of the following best describes the location of the thymus gland? B is correct. Between the lungs is the best answer choice. The thymus gland is found snug in between the upper lobes of the two lungs, and in the human body almost lies on top of the heart. 2. The maturation of functional T cells requires which of the following natural processes? C is correct. As mentioned in the article, T cells will mature via positive selection which is when only the functional T cells that respond adequately to foreign antigens will survive and proliferate. The others will initiate apoptosis.